Rase Heritage Society and the late Brian Ayre’s collection. This article was first published in the SLHA Past and Present,No 77 Autumn 2009. Written by Philip Earnshaw and Mal Jones. Mr Ayre had spent many years avidly building up a collection of artefacts of varied kind, from domestic items to machinery, with the dream of it becoming the basis of a future museum for Market Rasen. With this in mind, he held Steam Weekends at his Gallamore Lane property. Members of the Rase Heritage Society were invited to view this extensive collection in April 2008 and the Market Rasen Mail newspaper published a short article in order to publicise it. Although it was known that Mr Ayre, Brian to everyone, was not in good health, it still came as a shock to learn that he had suddenly passed away and our sympathies went out to his widow and family. The impression then was that nothing was to happen regarding the collection for some considerable time and so it took the Heritage Society by surprise when it was learned that it was all going to be put up for auction, since we had hoped to be able to obtain grant aid to purchase some of it. 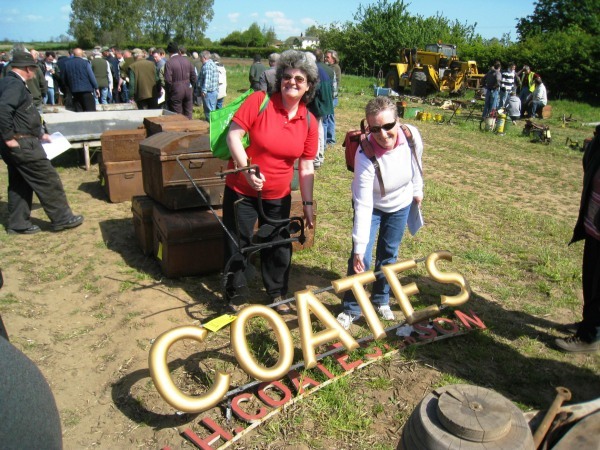 There were items of particular significance to the history of the Town and people which we did not want to go elsewhere (or worse, be destroyed.) A special meeting of the Society was therefore called to decide what we could do. The Meeting of April 22nd 2009 held at the Town Library. With the auction scheduled for April 30th and to run over three days, we had very little time in which to act. Hazel Barnard, as chairman and treasurer, had already had a meeting with the Auctioneers, Messrs Perkins George Mawer & Co. who had agreed to a deferment of payment on any items we were able to purchase at the auction, rather than having to pay on the day. Hazel put it to us that because of this we could ask townsfolk if they would be prepared to pledge money to us, for purchases, and pay a short time afterwards. The strategy was duly agreed. The Market Rasen Mail published a piece about our ‘plight’ in which pledges were sought by the Society. Those who pledged monies, could, if they wished, state what kind of item(s) they wanted the money to be spent on. This would especially apply where a business made a pledge to us and they could have the said item(s) to display at their premises in due course. The newspaper article included a form with which to return the pledge. The response we received was heartwarming, for in a matter of a few days we had received pledges to a total of £3,200.00, so clearly many people in the town were behind what the Society wished to achieve. Day one of the three day event took place on April 30th in the Corn Exchange building and was mainly of cameras, enamel signs and other smaller items. The auction was well attended and bidding for many items was fierce. With Hazel bidding for the Society we managed to acquire almost all of the items we wanted to save. Day two, May 1st, saw the auction move to the Gallamore Lane site, where the buildings were stuffed full of items, including lawnmowers, bicycles, oil engines, domestic utensils and other things, to such an extent that the auction actually took place in a huge marquee with the items displayed on a large screen. Bidding was conducted briskly and again, thanks to Hazel, we managed to obtain most of the items important to us. Regarding the policeman’s bicycle, Hazel was contacted by Mr Ingalls, of Rand, whose relative has been the policeman concerned. He wanted to bid for the bicycle and so Hazel made an arrangement not to bid against him. In return, Mr Ingalls agreed to buy the mangle which we wanted. Day three saw the sale of the larger items, which were spread around the farm field. Again we had a successful day. This very large item was going to be expensive to acquire (and save from probable scrapping) and so more money was pledged by three individuals to help secure this. The bid was successful. As the Printing Press was resident in one of the farm sheds, we were able, at the end of the day, to put our other larger items with it for security, until we could arrange to remove them to storage. One of the first tasks was to collect in the pledges and then show those who made the pledges what their money had bought. Then the challenge of storing what has been bought and finding ways of displaying it. Suddenly we found ourselves on a very steep learning curve. Professional advice has been sought from curators at Museum of Lincolnshire Life about cataloguing and also about the proper storage, restoration and conservation of the artefacts, The conservation department at University of Lincoln have restored some of our items under a mutually beneficial scheme, the students conserve the items as part of their studies and we receive back the completed artefact at minimal cost. Then there is researching the items to find out all we can about them and put them in their proper Market Rasen context. With a grant from Grassroots we were able to rent a room in Rasen Hub for a year, opening to the Public twice a week showing them our Collection which helped with the identification of some of the more unusual items. We registered with the National Museum Service and were issued with a number MRN RH (+year). The large number of items acquired at the auction formed the basis of Rase Heritage Society’s Collection. This changed the nature of the Society and presented it with new challenges – how to catalogue the items, how to store them, how to display them. These are challenges the Society is still having to meet. We hope that what will ultimately come out of this will be something of which Market Rasen will be proud and that will be a fitting tribute to Brian Ayre, without whose enthusiasm and dedication none of this would be happening.